November 16, 2013 By This post may contain affiliate links. 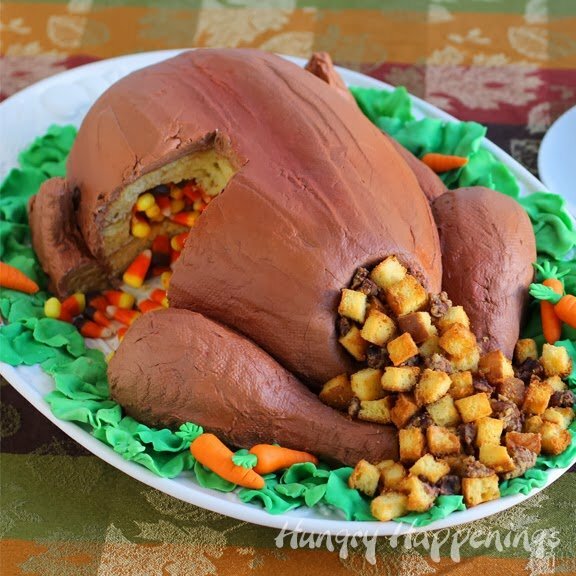 Shock the world this Thanksgiving and make this realistic candy filled Turkey Cake. This 3D cake looks like the real deal and your guests will cry and applaud and scream encore when they cut into it and realize there’s candy corn inside! Surprise your family when you cut into this roasted turkey cake and candy corn comes spilling out onto the serving platter. This cake made from three Betty Crocker Cake mixes will serve a crowd. Just be warned that you may have some infighting as people grab for a cake ball turkey leg. 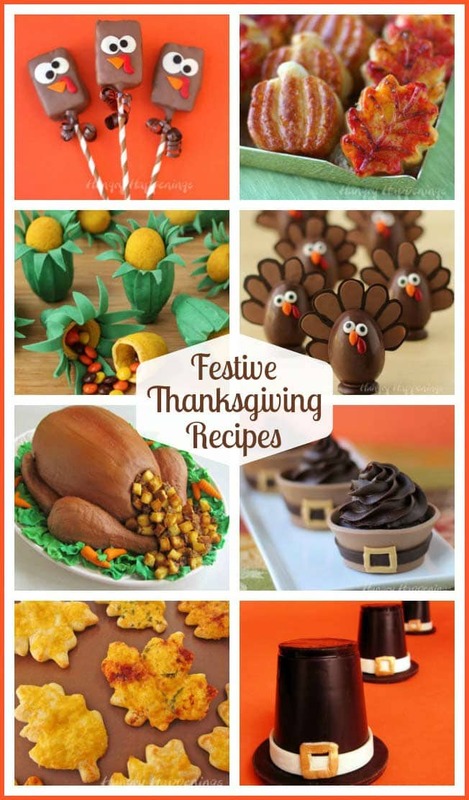 Others will want you to carve off some yellow cake turkey breast, and everyone is going to beg for some toasted cake stuffing complete with cake ball sausage. You can find the step-by-step directions to make this Thanksgiving Turkey Cake filled with Candy Corn over at Tablespoon.com. I’d love for you to leave some comments over on the Tablespoon site, if you like the cake I created for them. Thanks so much, Dani:) I shared this turkey cake with some friends and they all thought it was really fun! You did it again, that is, made another beyond amazing cake! Thanks, Kim. I've made and decorated more cakes this year than I have in years. It's been fun. So creative. This is awesome! Wow, I don't know if I'd have your patience, but it's impressive. You do need lot of patience and time to make this cake. It was a labor of love! Thanks, Lori. I just linked up! What an amazing cake! The turkey looks so realistic, and the stuffing – it looks so much like the real thing I can't get over it! Brilliant! Thanks. The stuffing is my favorite part of this cake design too! As soon as I saw this turkey I said, WOW..and I know Beth had to make it! This is awesome! I'm not even gonna lie and say I'm making one of these..but I sure wouldn't mind eating it..lol. (I tried to leave a comment at Tablespoon, but it would not accept my username. I even changed it up a couple of different ways) Love~Love~Love this cake! I totally get it, this cake was a lot of work!! I do appreciate you trying to leave a comment over at Tablespoon. They recently revamped their website, and they are having some issues. Thanks so much for featuring this cake! I'm glad you like it. No, they actually are not. I used a real turkey as my guide! This is just brilliant Beth!! So creative and genius! LOVE it! This is amazing! 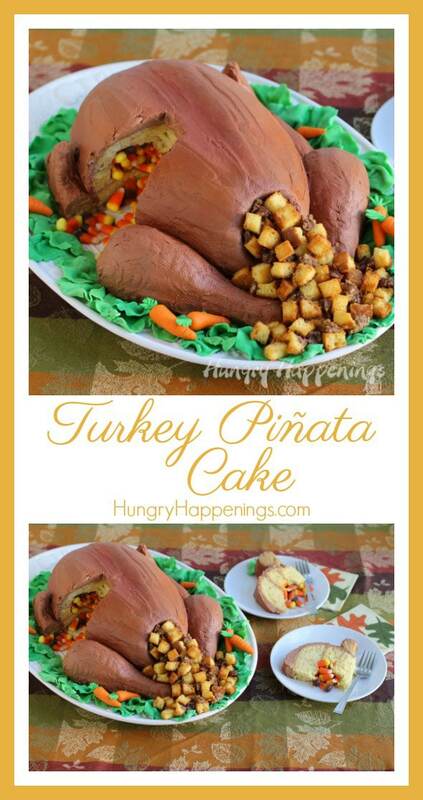 How fun would this be to have on Thanksgiving Day?!? I'll be featuring this on my blog tomorrow. I'm so happy to be featured! Thanks so much. Very creative I was wondering what you used to make the stuffing! Thanks, Veronica. I really wanted realistic looking stuffing so I added cake ball "sausage" to my toasted cake stuffing. I was really happy with how it turned out. How fun is that?!!! My family would get a real kick out of that 🙂 Even the "skin" looks so real! Love this – totally fun!! I went to tablespoon.com and checked out the recipe you did and tried to leave a comment, but there were no hot-links to do so 🙁 This is a fabulous idea!